Touch and Seal RL-4619 window left envelopes come with TS-100-I return envelope inserted. Sold in lots of 500. Choose from 1, 2, 5, 10 or 20 lots only. Your address is imprinted on the return envelope as well as on the window envelope (return address). Mailing envelope comes in blue, gray, ivory, or white; return envelope can be blue, canary, green, gray, ivory, or white. 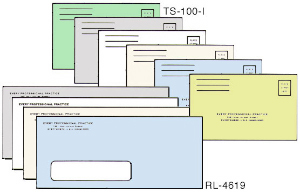 Mailing Envelope: RL-4619 is 9 1/2" W x 4 1/8" H. Return Envelope: TS100I is 3 7/8" H x 6 1/8" W.